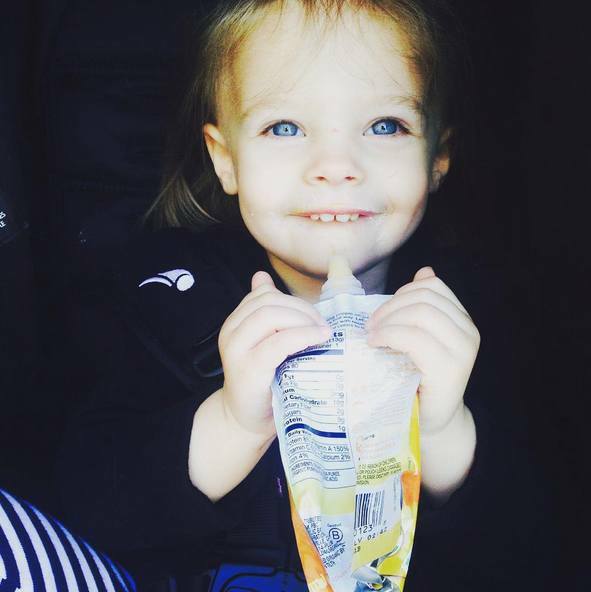 ‘General Hospital’ Kirsten Storms [Maxie Jones] has an adorable, blue-eyed messy toddler. The proud mom shared a pic of Harper Rose Barash [Georgie Spinelli] on a delightful spring day. Kirsten snapped a photo of her two-year-old mini-me enjoying a juice box. In the close-up Harper is all big blue eyes and a gorgeous smile. Always the fashionista, Harper is dressed in blue – which accentuates the color of those beautiful blue eyes. Related: ‘General Hospital’ News: Kirsten Storms & Brandon Barash Celebrate Easter With Harper Rose – See Adorable Pics! Fans want to see that smiling face back in Port Charles! Isn’t it time for Bradford Anderson [Damian Spinelli] to make a quick return to ‘General Hospital’? Perhaps for the Nurses’ Ball? Harper Rose is growing up so fast! It seems just yesterday that proud papa Brandon Barash [Johnny Zacchara] announced her arrival via social media. To prove she’s not a baby anymore Harper gave mom a smile that showed off her pearly whites! All Harper Rose’s baby teeth have come in! The little blonde blue-eyed munchkin should be a model she is that adorably cute! Before you know it Kirsten will be sharing photos of Harper headed off to preschool, then kindergarten, losing her first tooth! So many milestones to share and we can’t wait. Just the other day both Kirsten Storms and Brandon Barash shared Easter pics on their individual Instagram accounts. Harper wasn’t really fazed by all the hub-bub about the Easter bunny. However, Harper Rose now knows that there are lots and lots of sugary treats somewhere in the house. Do you think Harper Rose Barash will return to ‘GH’ as Georgie anytime soon? It would be great to see Kirsten Storms and her carbon copy blonde cutie on the small screen together again, don’t you think?